Discussion in 'Trading' started by kenji, May 7, 2017. Price is 4 ped/k but if you buy them all (26k atm) can be lower. Cheers! Tell me more! Wht can i get for these tokens? If i remember correctly the hub only is only wearable in hub right? How many tokens needed for each of those coats? 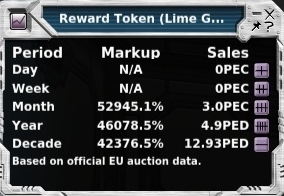 You need 550 000 Lime green Tokens for each coat ! Damn, that is a bit too much for me. Not saying price is unfair thou. 3 peds/k atm, 27k for sale.